Janet McBride had to send someone to fetch lunch for her Saturday. The cheerful auto dealer receptionist didn’t dare leave her switchboard during the waning hours of the federal government’s "Cash for Clunkers" program. “Our phones have been ringing off the hook,” said a giddy Pete Richards, general manager of Ed Voyles Honda in Marietta, Georgia. “… It’s been great. Phenomenal.” McBride was compiling a list of customers for swamped salespeople to call back. “I try to keep it under control,” McBride said. “I think we need one of those number things — ‘Now serving Number 5. '” As of 11 a.m. Saturday, the Honda dealership just north of Atlanta said it had made 108 clunker deals since the Car Allowance Rebate System program began on July 1, and Richards expected to do plenty more before closing down Sunday night. 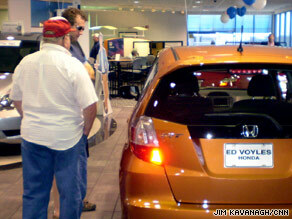 Watch what car buyers need to know » “If I don’t do 30 of these today, I’ll be amazed,” he said. A normal Saturday would produce about 12 sales, he said. The program has generated so much traffic and new-car buzz that even non-qualifying and used car sales have jumped, Richards said. Germany’s Solution to Big Auto’s Woes: Scrap That Clunker!